This whole post series began with the idea for candied citrus confetti. Once I worked my way through that project, I realized my candied little treats needed an appropirately tasty home. I didn’t want to buy even more citrus, because I’m pretty much the only one in my house that will eat a non-chocolate or non-caramel based dessert. (My boys like their sweets sweet.) I needed to find something to do with just my three little naked fruits. Solution: a teeny tiny recipe that yields four perfectly sized loaves for one, or a single little cake for slicing and sharing. 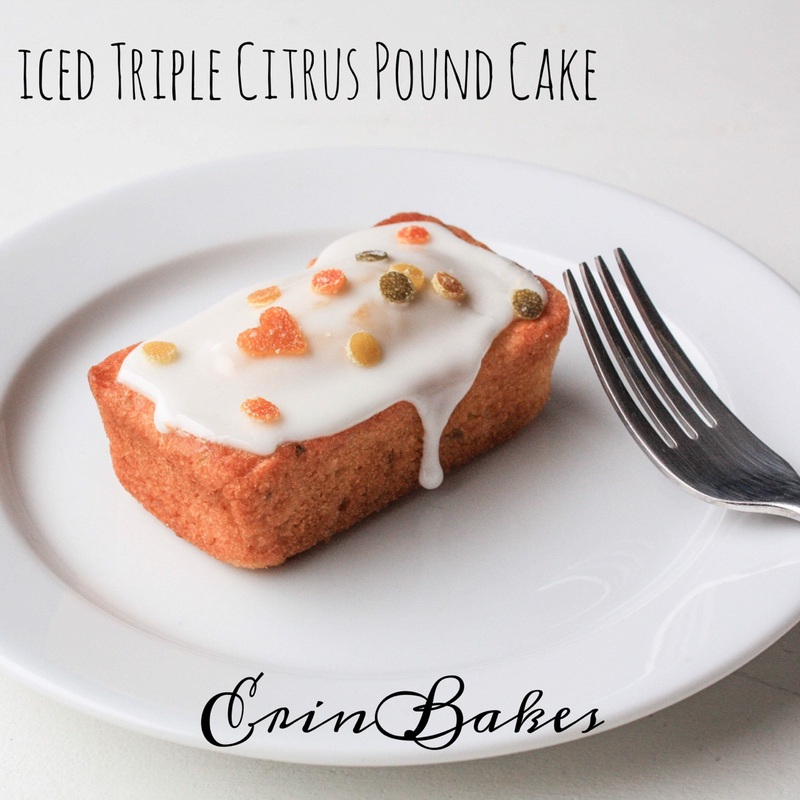 I combined the juices of my leftover lemon, lime, and orange and used a tablespoon of that juice in the icing recipe. The chopped candied zest scraps are what flavor the cake. Later this week, I’ll share with you what came of the remaining juice. A magical, microwave curd. Believe it. Makes four 4-ounce mini loaves or a 6-inch round cake. 1. Position a rack in the center of the oven and heat the oven to 350 degrees. Spray four 4-ounce mini loaf pans (or a 6-inch round pan) with cooking spray. 2. In the bowl of a stand mixer fitted with the paddle attachment (or in a large bowl with a hand mixer) cream the butter, sugar, honey, baking powder, salt, and vanilla extract until thoroughly combined and fluffy, about 5 minutes. Stop half way through to scrape down the sides of the bowl with a rubber spatula to make sure there are no butter lumps. 2. Add the egg until completely combined. 3. Add the all purpose flour and mix on low for a minute. While the mixer is running, slowly pour in the milk and continue to mix on low until the batter just comes together. 4. Take the bowl off of the mixer (or remove the hand-mixer) and fold in the candied zests using a rubber spatula. 5. 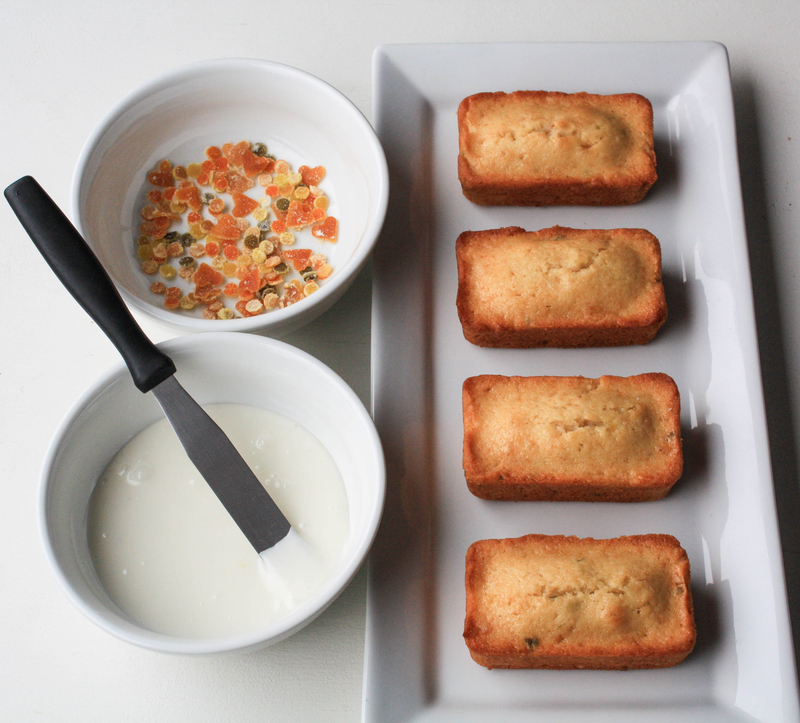 Place the loaf pans onto a cookie sheet, and divide the cake batter evenly between them (you do not need the cookie sheet if you’re using a single cake pan) and bake until a toothpick inserted in the center of a cake comes out clean or with a few moist crumbs clinging to it, 15-18 minutes (20-25 for a 6-inch round cake). 6. Let the cakes cool in their pans for about 10 minutes. Turn the loaves out onto a rack and allow them to cool completely before icing or storing. Once cool, the unfrosted cakes cane be wrapped in plastic wrap, or placed in a zip-top bag, and stored in the refrigerator for up to two days. Makes about 1 cup of icing. 1. In a medium sized bowl, whisk together the citrus juices, powdered sugar, and salt. 2. Add milk 1 tsp at a time until you reach your desired icing consistency. Add less for a thicker frosting, more for a thinner glaze. 3. 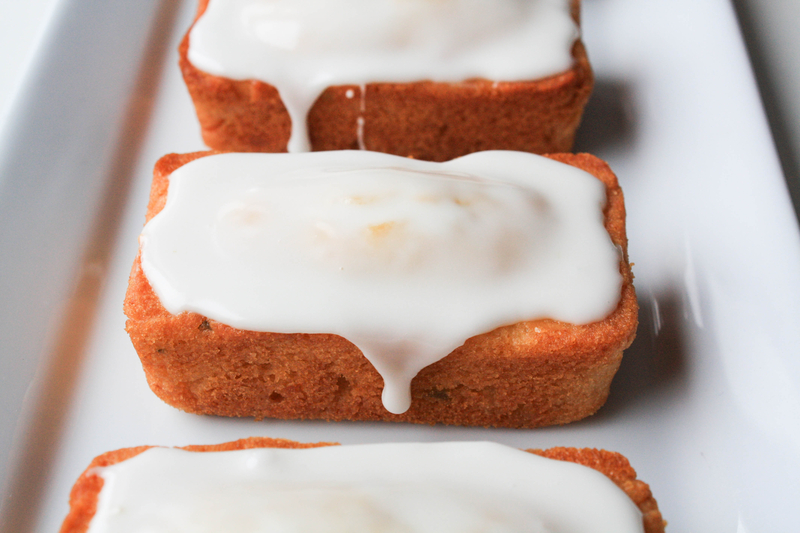 Spread the icing on top of your pound cakes using an offset spatula or knife. 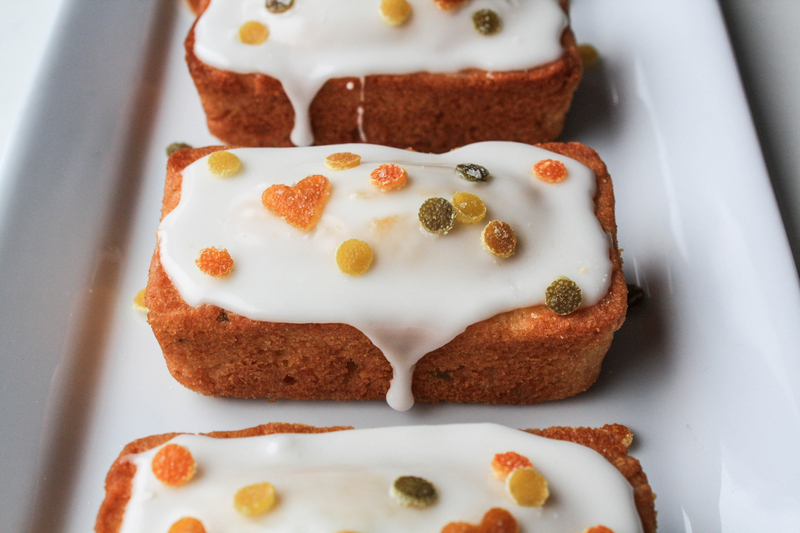 Sprinkle on the candied citrus confetti while the icing is still soft. 4. Store any leftover icing in an airtight container in the fridge for up to a week. Press a piece of plastic wrap directly against the surface of the icing before covering. This helps prevent the icing from becoming too hard to use. I know what I want for my birthday, these pound cakes look awesome!